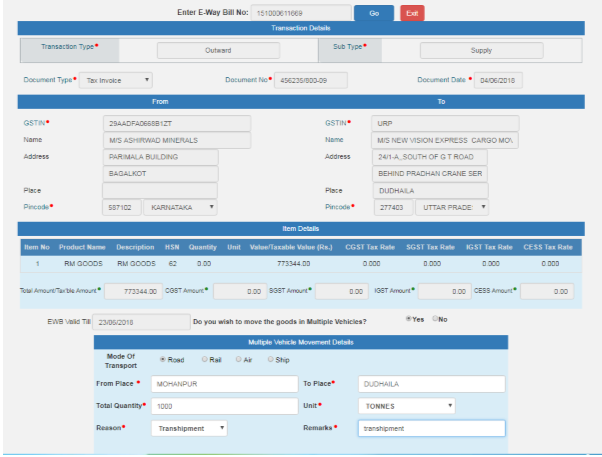 Now You Can Generate Multi-Vehcle Eway Bill for Single Consignment- in a Transhipment Mode. 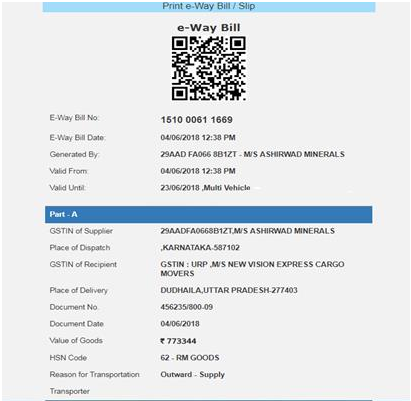 The new option has been introduced wherein the consignment of one e-way bill has to be moved in multiple vehicles, after moving to transshipment place. For example, an e-way bill is generated and needs to be moved from A to C. Here, the consignment moves from A to B via Rail or bigger vehicle. Now, it is not possible to move the consignment from B to C in the same mode of transportation due to unavailability of that mode or may be due to hilly region where big vehicles cannot be used. In such cases, the consignment needs to be moved in multiple smaller vehicles. 1. 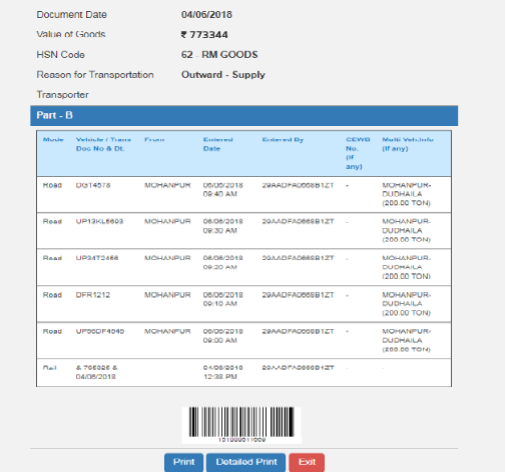 First generate the e-way bill with source and destination as per the document/invoice. 2. Carry out the first leg of movement of the consignment up to the transshipment. 4. Now, when the consignment has been loaded to the smaller vehicle, update the ‘PartB’ of the e-way bill with the vehicle number, along with the quantity loaded, and move the consignment. 5. Step No 4 may be repeated till total quantity is loaded and moved. The system will not allow the quantity to be shipped in multiple vehicles more than what has been declared while marking the e-way bill for mulit-vehicle. 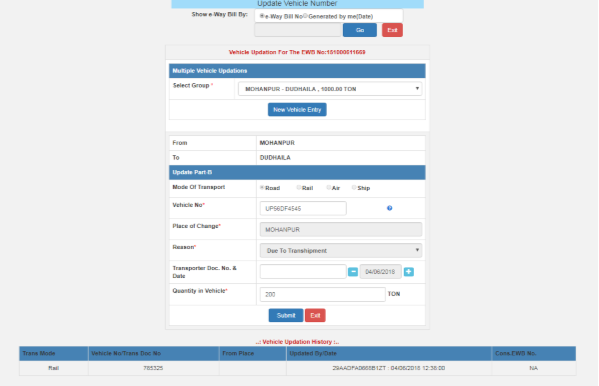 Select the ‘Change to Multi Vehicle’ option from the menu and enter e-way bill number to be changed to multiple vehicles for further movement and the system shows the details for e-way bill. Here, confirm for the multiple vehicles movement and enter the ‘from place’, ‘to place’ , quantity of the consignment and reason to go for multi-vehicle. Once it is submitted, the Eway bill is changed to the multi-vehicle movement. Now, whenever the part of the consignment has to be moved, select Update Vehicle option and select the group as shown below. The group is from place – to place. If for the movement, multiple ‘from place – to place’ has been entered, the system shows the details accordingly. Now, enter the vehicle details as usual along with the quantity being moved and submit. The print of the e-way bill looks like this. Please note the ‘Valid until’ column indicates the Multi-vehicle and Part-B contains the ‘from place – to place’ along with the quantity is being moved. This way once can use the facility for split movement of one consignment of one eway bill.